Adolescents in Family Court are at a critical point in their young lives. They have become involved in the criminal justice system at a very young age. Many have negative patterns of behavior in their relationships with family and peers and lack the motivation and/or the opportunity to learn new behaviors that will help them begin to achieve traditional thresholds of positive development (e.g., at home, in school, and in their relationships with other teens). A young person’s experiences during this vulnerable time can determine whether he or she faces a long-term, cyclical pattern of involvement with the criminal justice system or has a real pathway to a productive, positive life in the community. 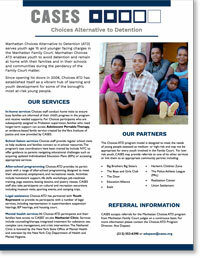 CASES Choices ATD (alternative-to-detention) program seeks to use a young person’s early involvement in the justice system as an opportunity for interventions that prevent further delinquency while promoting positive, sustainable youth development. Research has demonstrated that the most effective juvenile justice interventions help young people build positive relationships and develop constructive behaviors rather than “scaring them straight.” Accordingly, in Choices ATD—serving youth age 12-16 involved in either the Bronx or Manhattan Family Court—we build service plans responsive to each young person’s risks and needs, with a focus on engagement with peers, family, and community. Choices enables these youth—all of whom have pending Family Court cases—to avoid detention in a City or State correctional facility, remain with their families, and continue in school. With locations in Central Harlem and the South Bronx, Choices helps youth re-engage in their education, access social services and recreational opportunities in their communities, build positive peer associations, and improve family relationships.